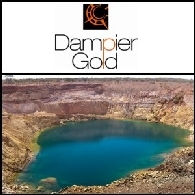 Dampier Gold is positioning itself to be among the next generation of Australian gold producers. The Company is evaluting and exploring ~700km2 of the Plutonic-Marymia Greenstone Belt in central Western Australia with a view to near-term gold production. The project currently hosts defined Mineral Resources of 434,000 ounces of gold and Ore Reserves of 35,000 ounces of gold.